Formed by Ralf Hütter and Florian Schneider in Düsseldorf, Germany in 1970, the men-machines of Kraftwerk were at the forefront of experimental electronic music. Their 1974 breakthrough album, “Autobahn” remains a great influence in the genre and is a favourite driving album for those that like to travel at speeds in excess 200 kmph. My UK copy is marked as a 1978 release but other sources say that it wasn’t released in the UK until 1981? I sense a conspiracy ….. or was I head of my time? Probably not, I think I nicked it off my brother. 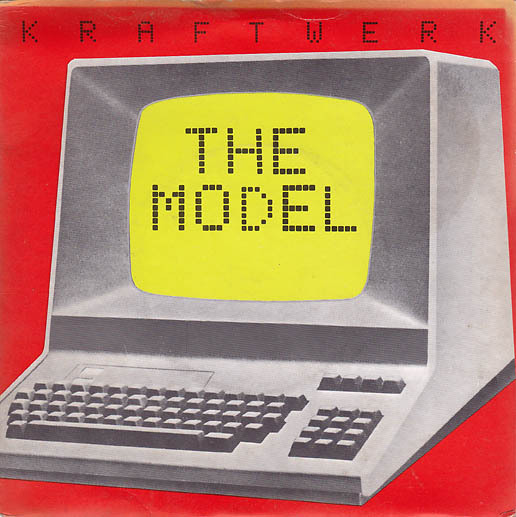 Coupled with the smooth “Computer Love” on the B-side, “The Model” reached No 1 in 1981 and was the band’s most successful werk and still sounds like the future. This entry was posted in Music and tagged 7" single, Computer Love, Das Model, electronic, Florian Schneider, German, Kraftwerk, music, Ralf Hütter, Record, The Model, vinyl. Bookmark the permalink.